American Airlines plans to cancel 90 flights each day while the Boeing 737 MAX aircraft is grounded. According to American Airlines, there are 24 MAX aircraft in their fleet that are still awaiting approval from the Federal Aviation Administration, the Department of Transportation, the National Transportation Safety Board and other regulatory authorities, as well as Boeing. "In the meantime, and in an effort to provide more certainty to our customers and team members and better protect our customers on other flights to their final destination, American has extended cancellations through April 24, which will result in approximately 90 cancellations each day. Canceling in advance provides additional availability and rebooking options for our customers," according to a press release from American Airlines. 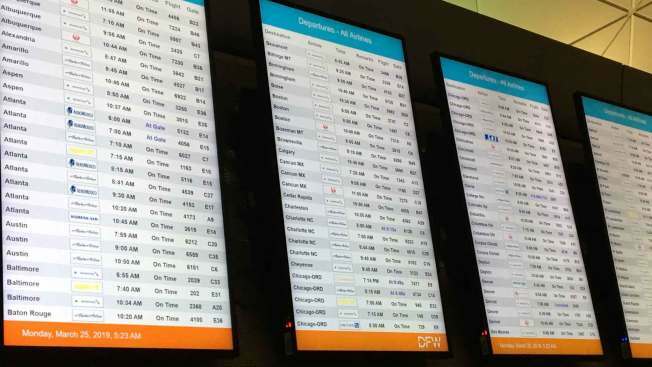 American Airlines also confirmed Monday morning at least one aircraft at Dallas-Fort Worth International Airport sustained damage due to Sunday evening storms. The airline tweeted to a passenger that all aircraft would be inspected before takeoff. Nearly 30 flights were canceled Sunday due in large part to weather, but American Airlines told NBC 5 those cancellations were not due to damage. American Airlines Reservation team plans to contact each affected customer directly by email or phone.